I have shared a list in excel format which you can download it as a pdf or xls/excel sheet by clicking the link. Its a free download and open link for all. You don't need to request permission from me. The quantity I have given would come for 1-2 months for a pucca South Indian family of 2 adults, 2 kids. North Indians, please adjust the quantity of rice and atta as per your need. Bachelors, do reduce the quantity by half. Do follow this list for the first month and based on your need & usage, you can alter it. I have also shared some images for the list separately. U can save it in your mobile and cross check the ingredients while you purchase. I hope this list would be useful to you all. Do leave a message if u feel i had left anything important. I will include it. Also leave your feedback in the comment section if this list helps you. I would be more happy to know it.Thanks. Please click on the image below to view the excel sheet. Please click the text below for dowloadable PDF. 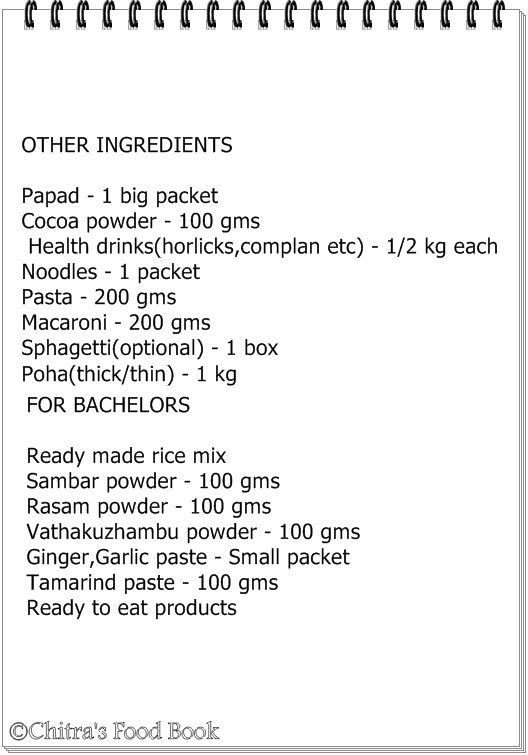 Indian,Monthly A-Z grocery list for 2 persons..
My mom always starts the list with turmeric powder,sugar & jaggery sentimentally. So I too follow the same. 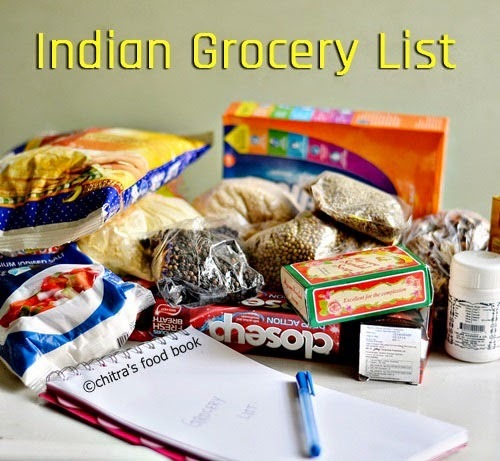 I have shared separate images for groceries, pooja items, toiletries and miscellaneous items. Right click and save the respective images. Here I have given the quantity of rice more than wheat as I had focussed south indians. North Indians, please exchange the quantities of rice and wheat as per your requirement. Please give credit for this blog if you are using these images elsewhere. Thanks for understanding.Click this link to download the grocery list in Excel format or PDF. You don't have to get access permission from me. Check out my Kitchen Utensils & tools list and Kitchen appliances list for setting up a new kitchen. Hope you find this post useful. Please leave a message in the comment box if I have left anything important in the list. Thanks ! Oh my dear CHithra, You are awesome, you saved my stress and time. These grocery list are extremely helpful. Thanks a ton. and money it will save for all of us. Once again thanks for ur time and hardwork. Thanks a lot for sharing this post Chitra. This list would be a saviour for many of us. Yes Its missing in the list. I will update it. Thank you so much. You made my day. :) New to US and i didn't know what to shop for in the grocery store. Now I have it. Tada! Sorry, budget cannot be given as the rates keep changing.